On the west coast of Florida, overlooking the beautiful Gulf of Mexico, you’ll find Siesta Key – a quaint and scenic island that boasts one of the top beaches in the world, as well as great nightlife, excellent sports facilities and plenty of luxurious and amenity loaded rental homes. What are the things to do on Siesta Key? With great day trips, outdoor recreation, shopping and restaurants near our luxury vacation rentals, you will never run out of vacation activities. Just a short drive away from Tampa and with several transportation options for both local and international travelers, Siesta Key is a dream vacation destination for many – and it’s easy to see why! You’ll find a wide range of attractions and destinations for those staying in Siesta Key rental homes, whether you’re into relaxing beachside or partying all night long. Check out some of the most exciting activities you can enjoy and other popular Siesta Key things to do below. Siesta Key is home to a number of beaches, but none are more famous than Siesta Beach itself, which is one of the top destinations on the key. This beach has famously been crowned the best in the world for a variety of reasons – primarily the incredibly quality of sand here. Most beaches around the globe feature sand that is 99% pulverized coral, but the sand on Siesta Beach is almost 99% white quartz from the Appalachian Mountains. The sand feels cool to touch, even in the blistering Florida heat, and it’s soft and silky beneath your feet at all times – pure bliss! Other wonderful beaches in the area and that are located near many rental homes include Crescent Beach, where you can marvel at wonderful sunsets and Turtle Beach, a perfect family friendly beach where you can spot nesting turtles and hatchlings if you visit at the right time of year! You’ll find hundreds of different species of fish in the Sarasota streams and lakes, and fishing is a popular hobby and sport in Siesta Key. If you’re a fan of fishing, you’ll find plenty of bait shops and fishing charter companies available for a variety of trips and tours that you’ll never forget. Turtle Beach Pier has great fishing facilities – and you can marvel at a fantastic view while you cast your line. Alternatively, there a lots more piers and bridges near most Siesta Key rental homes where eager anglers set up camp for the day around Siesta Key. Remember: if you’re planning to go fishing while you’re in Siesta Key, make sure that you have a valid fishing license. If you’re heading off with a fishing charter company, they can handle the licensing issue for you, so this may be the best option if haven’t bought or renewed your license yet. As you might expect for a coastal village, Siesta Key has an abundance of seafood restaurants and grills which are among the most popular attractions and destinations on the key and are scattered around the village. From the Siesta Key Oyster Bar (affectionately known in the local area as ‘SKOB’) to Gilligan’s Island Bar and Grill, those who love seafood will certainly find something to tantalize their taste buds here in Siesta Village. Aside from oysters and shrimp, there are plenty of other restaurants serving up international cuisine of a very high standard. A Taste of Germany is a quaint restaurant with a menu packed with strudel, liquor cakes, bratwurst and sauerkraut, while Bonjour French Café serves up crepes, croissants and a delightful variety of other French delicacies. Visit The Cottage Restaurant for authentic tapas-style Spanish food, or hit Solorzano’s Pizzeria for pasta, pizza, calzones and all your other Italian favorites. There’s plenty of wildlife attractions for animal lovers to enjoy in nearby Sarasota and Siesta Key in particular. If you head to Turtle Beach during nesting season, you’ll catch a glimpse of the dozens of turtles that head to this beach every year, ready to birth and raise their young. While you’re at Turtle Beach, try out the most popular kayak tour on the Island managed by the Jim Neville Marine Preserve. The tour starts from Turtle Beach and heads to Little Sarasota Bay, taking in the various seabirds, manatees and the other local wildlife. Some lucky visitors might even see a dolphin on their way! 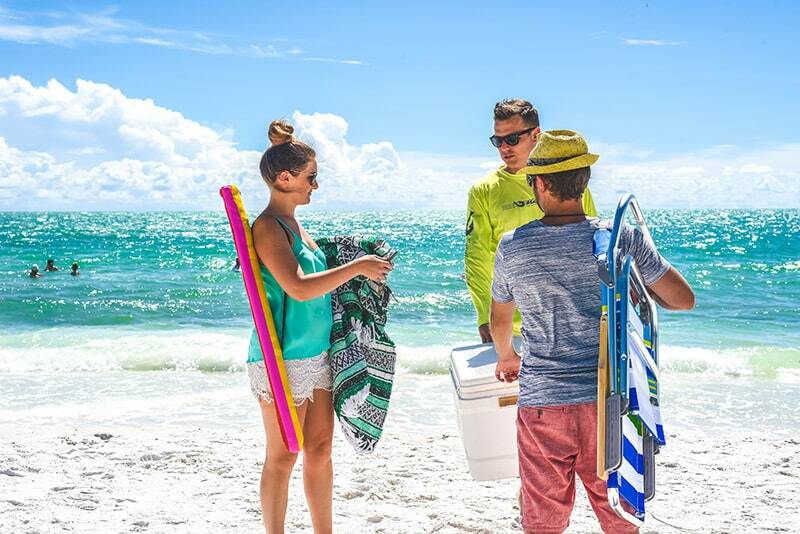 If you’re not the kind of person who can sit around on the beach for the duration of your vacation, Siesta Key has plenty of exciting, adrenaline-pumping activities for you to enjoy. Why not try parasailing over the bay, with incredible views of the Gulf of Mexico? If you can time your parasailing booking around the time the sun goes down, you’ll be in for a real treat. The surf is great around Crescent Beach in particular – and you can try paddle-boarding if you’re up for a new challenge. You’ll find plenty of instructors and rental shops around the beaches located near your Siesta Key rental home, if you feel like you want to try something new. Don’t forget The Adventure Tiki hut located at Tropical Breeze Resort, that our guests can rent anything from bikes, paddle boards, beach equipment and more! Siesta Key is a relatively small island, and you can walk to most of it from your rental home if you wish – but why go on two feet when you could go on two wheels? There are a multitude of bicycle hire shops around the island, or you could push the boundaries and hire a Segway to see even more of the island without tiring yourself out too much. Siesta Key Village is home to an array of 100 shops, cafes, restaurants and galleries, so if you have a spare afternoon, why not explore some of the interesting boutiques? Many of the shops sell traditional vacation knick-knacks and lovely gifts for family and friends. You’ll find that St. Armand’s Circle is also a prime shopping destination, and the shops in this area have a distinctly upmarket European vibe. As you can see, there’s plenty of things to do on Siesta Village, whether you’re primed for action or eager to relax on the beach. If you’ve booked a Siesta Key rental home, be sure to check out some of these top-rated activities!